Slurp this sweet and savory summer treat from a tamarind-and-chili-paste-coated straw. If you need to cool off during the summer, opt for something more adventurous than ice cream, slushies, and Popsicles. Try a mangonada. The umami dessert is an open secret in Mexican communities. Imagine a tall cup filled to the brim with mango sorbet and layered with liquid chamoy—a savory condiment made from pickled fruit—lime, and the chili-citrus-salt seasoning known as Tajín. Often, the cup is topped off with chunks of frozen mango. To tuck into your treat, you can opt for a tamarind-and-chili-paste-coated straw or a spoon. Each mouthful promises a tangy taste of sweet, sour, savory, and salty. A person with a low tolerance for spicy foods might be frightened by the streaks of red running through the orange base. However, there’s nothing to fear. Its spice index ranks on the low end. The chamoy and Tajín are added to season the treat, not add heat. The dessert originated in Mexico and has been around for more than two decades. While its popularity in the United States has begun to rise, it’s still unavailable outside of Latinx neighborhoods. The dessert is also known as a chamango. 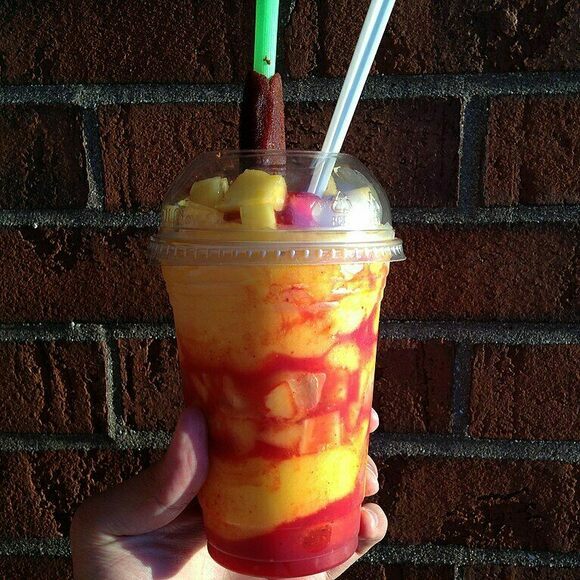 However, mangonada remains its most popular name. Add tequila to turn the tropical treat into an adult beverage. This palm fruit has a surprisingly meaty flavor.